Firstly kudos to NASA for landing their 1 tonne Mars Rover last night whilst us Brits were snoozing in Bed. Despite being a year of Olympics, it's looking like 2012 will be the biggest year in science/engineering for a long time. Lets get back on topic. A library of materials is defined within separate XML files which are specific to each Render Plugin. In most CAD packages there are generic realistic materials such as steel, copper or brass. In the base materials library these will be defined so that you can more easily switch render plugins. These XML files can provide 'built in' or 'external' materials. 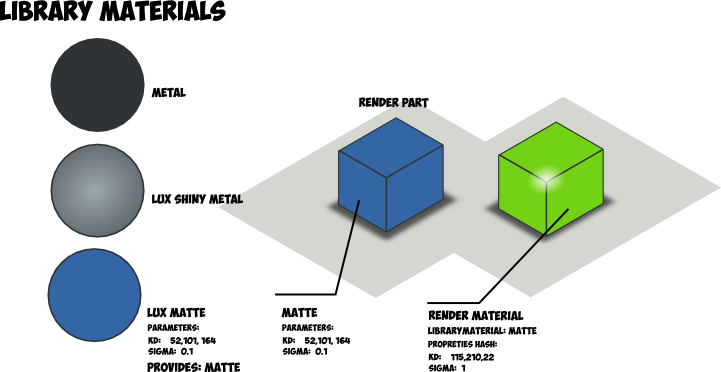 External materials are essentially templates defined in separate files. See here for an example of this proposed XML description. These Library Materials are used for reference: FreeCAD will create a new material referencing this RenderMaterial which includes a default set of values for each parameter. These parameters can be overriden to change material properties such as the Matte colours (Kd). These render materials are later used within the Render and their properties are used to define the material. I am hoping this structure provides a more flexible approach to managing a wide variety of materials from different render plugins. These Material Libraries can be extended by adding more XML descriptions and perhaps late in the future, users can post their materials on-line in a repository which can be universally accessed.